Our school was founded by the Society of Jesus. This Catholic order was established in 1540 by St. Ignatius of Loyola. From the beginning the Society of Jesus has regarded the education of the young people as one of her most important tasks. At present she maintains our 550 universities and high schools in many courtiers and has developed into one of the largest educational enterprises in the world. In this country the Society of Jesus has, besides Rokko, three high schools, namely Eiko Gakuen in Kamakura, Hiroshima Gakuin in Hiroshima, Taisei Gakuen in Fukuoka, and two universities, Sophia University in Tokyo, and Elisabeth University of Music in Hiroshima. Among these, Rokko, the oldest high school, was founded in 1937. She can be regarded as a pioneer of Jesuit education in Japan. The foundations of our school were laid by our first principal, Father Takemiya Hayato,S.J., who guided our school through her first 27 years. 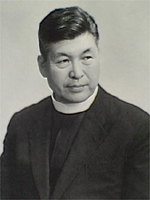 Father Takemiya steered our school through the stormy times of the Second World War and the difficult post-war period with a steady hand and with his eyes fixed on the future guided by the unchanging principles of human values. Through the years the facilities of our school have been set up one after another, e.g. the main building, the auditorium, the gymnasium, and the sports ground. Some of them were changed, others rebuilt, so that very little of the original school buildings remains today. But in front of the main building the huge stone monument with the words of the founder, Father Takemiya "Let us think quietly of things eternal" still expresses the spirit in which our school was founded.